If you’ve ever misplaced your smartphone you know that as soon as you realize this, panic installs pretty fast. Did someone steal it? Did I forget it somewhere? These are just a few of the million questions that probably race through your mind in a moment like that. Luckily, there are ways to find your lost or stolen Android phone, which is the first step to getting it back! Since iOS users have a “Find My iPhone” feature, it’s only natural Google provides a similar feature called “Find My Device”. This tool can help you locate the device and hopefully, you’ll also be able to retrieve it. The best part is, you can use the Find My Device service even if you weren’t careful enough to install it on your phone before losing it. 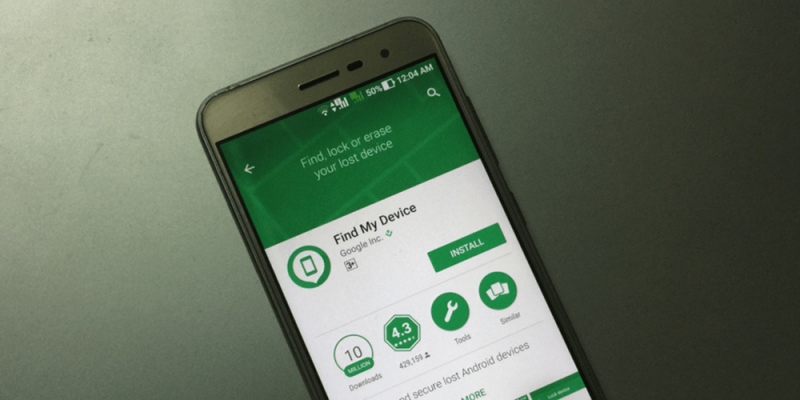 There are actually several methods you can use to find your lost or stolen Android phone, and we’ll detail them all below. Open Chrome on your PC and make sure you’re logged into your Google account. 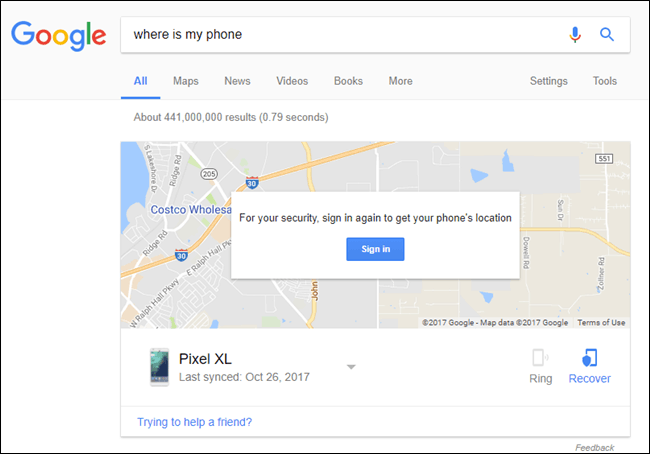 Perform a search for “where is my phone” in Google or directly in Chrome’s address bar. The search results will display a small “Find My Device” window and you might be prompted to sign in again (for security purposes). Click the “Sign In” option and enter your Google credentials again. As soon as you sign in, the Find My Device web page will open and it will attempt to locate your phone. Once your phone appears on the map, you can set it to play a sound for 5 minutes, lock it and display a message on the lock screen or erase all of its contents. Keep in mind that if you use the third option, you won’t be able to track the device anymore. You don’t need to have a computer to find your lost or stolen Android phone. Another Android phone or tablet will work as well. 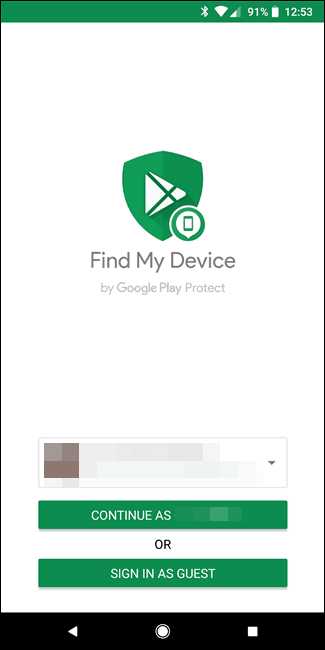 Start by installing the Find My Device app on it from the Play Store if it wasn’t already. If you own the second Android device you’ll be able to sign in with just a tap, but even if it’s someone else’s you can sign in as a guest. Once you’re signed in, the Find My Device screen will display your phone’s locations, offering the same options as the web interface. If you have a non-Android device (such as an iPhone) at your disposal, you can still use it to locate your lost Android phone. Just open a web browser and go to www.google.com/android/find and log into your Google account. Then, you can select the device you want to track (assuming you might have more than one associated with your account). If you suspect you lost your phone in a familiar environment (e.g. in your house or office) making it play a sound can be useful. However, if there’s a good chance someone stole it, I wouldn’t recommend using this option as it could alert the thief. In this case, your best bet is to use the Find My Device tracking capabilities and alert the proper authorities. It’s not a good idea to go after it yourself – people have been known to get injured or even die when confronting thieves themselves. When there’s no hope of getting the device back (then, and only then) you should definitely use the “Erase” option. This will wipe all data (including the SD card if there is one) and it’s a simple way to protect your privacy. However, keep in mind that once you do this, you will no longer be able to track your phone so consider other options before erasing the device. If your Google account has Two-Factor Authentication enabled this might be a problem as you’ll be prompted to enter a six-digit code to access your account. Normally, you’d get the code via SMS or an app such as Google Authenticator, which isn’t possible without your phone. The first time you set up two-factor authentication, Google will provide some backup codes. It’s a good idea to write them down and keep them somewhere safe, as at some point they might be the only thing that will allow you to track your lost Android device.